Meinl Percussion's Headliner HB100VSB Wood Bongos are a great choice for anyone getting up and running with their bongo playing. Environmentally sustainable rubber wood is used to make the shells of these bongos to offer awesome sound, and projection. They feature 6.75" and 8" natural buffalo drum heads. Tuning and servicing your Meinl Percussion Headliner HB100VSB Wood Bongos is easy with their 8mm tuning lugs and included tuning key. The Headline Series HB100VSB Bongo drums are a wonderful way to get into serious bongo percussion. 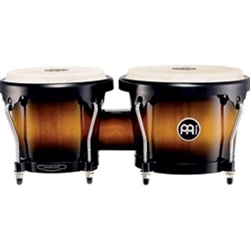 Start your journey with a set of Meinl Percussion Headliner Series HB100VSB Wood Bongos.